More Webcam Photos - Head and Neck? After the recent offering of webcam photos, I got an email from another webcam user who had some pictures to tell about. Here name is Diana and they are quite an interesting sequence. If one was bold for Nessie, you may think you were looking at a long neck which appears, begins to submerge and is gone in the third picture, all in the space of 27 seconds. The pole like object can be seen just left of centre above the third tree from the left. A zoom in of the object in its two aspects are shown below. The first image certainly has that pole like quality that is reminiscent of Loch Ness Monster sightings. What it actually is becomes another matter. You may notice the strange looking pixel structure to the bottom right of the second image which likes a square with four smaller squares at each corner. What is that? Can this artifact bring a charge of photoshopping or is it just a cursor in an inconvenient spot? Remember those childhood puzzles where you had to find small objects in complex pictures? Feel free to locate this cursor in the first picture (as I did)! Is it actually in the water? I would say it is. How big is the object? One foot, three foot, six foot? That is not so easy to determine, but as a comparison photo is shown below of a passing boat as supplied by our previous webcammer, Joaquin. The boat could be about thirty feet long, but note its perceived length is foreshortened due to it being turned towards the camera. As ever, webcam photos can be frustrating due to the distances involved. As a consequence of this, opinions are again invited. 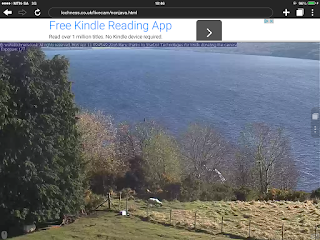 Further information on pole-like Nessie sightings can be found here.